In the end of the sabbath, as it began to dawn toward the first day of the week, came Mary Magdalene and the other Mary to see the sepulchre. And, behold, there was a great earthquake: for the angel of the Lord descended from heaven, and came and rolled back the stone from the door, and sat upon it. His countenance was like lightning, and his raiment white as snow: And for fear of him the keepers did shake, and became as dead men. And the angel answered and said unto the women, Fear not ye: for I know that ye seek Jesus, which was crucified. He is not here: for he is risen, as he said. Come, see the place where the Lord lay. And go quickly, and tell his disciples that he is risen from the dead; and, behold, he goeth before you into Galilee; there shall ye see him: lo, I have told you. And they departed quickly from the sepulchre with fear and great joy; and did run to bring his disciples word. And as they went to tell his disciples, behold, Jesus met them, saying, All hail. And they came and held him by the feet, and worshipped him. Then said Jesus unto them, Be not afraid: go tell my brethren that they go into Galilee, and there shall they see me. Now when they were going, behold, some of the watch came into the city, and shewed unto the chief priests all the things that were done. And when they were assembled with the elders, and had taken counsel, they gave large money unto the soldiers, Saying, Say ye, His disciples came by night, and stole him away while we slept. And if this come to the governor’s ears, we will persuade him, and secure you. So they took the money, and did as they were taught: and this saying is commonly reported among the Jews until this day. Then the eleven disciples went away into Galilee, into a mountain where Jesus had appointed them. And when they saw him, they worshipped him: but some doubted. And Jesus came and spake unto them, saying, All power is given unto me in heaven and in earth. Go ye therefore, and teach all nations, baptizing them in the name of the Father, and of the Son, and of the Holy Ghost: Teaching them to observe all things whatsoever I have commanded you: and, lo, I am with you alway, even unto the end of the world. Amen. And it is a gladness and a joy for us in the First Baptist Church of Dallas to welcome the uncounted multitudes of you who are listening to this service on radio. This is the pastor of the First Baptist Church delivering the message entitled Our Lord’s Entrance into Resurrection Life. It is one out of a long doctrinal series on Christology: Our Lord’s Entrance into Suffering; Our Lord’s Entrance into the Grave; Our Lord’s Entrance into Resurrection Life; Our Lord’s Entrance into Heaven; Our Lord’s Entrance Beyond the Veil; this morning, Our Lord’s Entrance into Resurrection Life. In the twenty-eighth chapter of the First Gospel, the Gospel of Matthew, “The angel said unto the women, Fear not: for I know that ye seek Jesus, who was crucified. He is not here: He is risen, as He said. Come, see the place where the Lord lay” [Matthew 28:5-6], Jesus raised from the dead. Many long years ago, I listened to a very gifted and learned missionary to China by the name of Dr. E. M. Poteet. He was a professor in Shanghai University. And as I listened to him, he described the class he was teaching in Shanghai, and he was speaking of the resurrection of our Lord. And one of his students broke in and said, “Sir, I do not believe that.” And the missionary, Dr. Poteet, asked the student, “Well, why do you not believe that?” And the lad replied, “Sir, dead men do not rise again.” The boy had a good point. I have never seen anyone raised from the dead, nor have I ever heard of anyone who ever saw anyone who saw anyone rise from the dead. It seems to me that when they die, they stay dead! Why should I persuade myself that Jesus rose from the dead? How can I persuade myself that such a propaganda is substantiated in historical fact? Ordinarily, I would not pay any attention to it one way or another, whether it is true, whether it is not true; I’d not bother to find out. There are many allegations in history that historians discuss; whether they are true, whether they are not doesn’t make any difference. They’ll discuss whether Alexander the Great sat down on the banks of the Indus River and wept because there were no more worlds to conquer. Whether it’s true or not makes no difference. They’ll debate endlessly whether Caesar crossed the Rubicon River; whether he did, whether he didn’t doesn’t make any difference. In our own national history, endlessly they discuss whether Washington threw a dollar across the Delaware River or cut down a cherry tree. Whether he did, whether he didn’t doesn’t make any difference. But this is the most significant historical asseveration in human life! There is more that rides upon that answer than human mind could imagine or human speech could describe. Did Jesus rise from the dead? Historical affirmation with great certainty is most difficult, most difficult. There has to be somehow an affirmation from God for a fact to become regnant and living in our hearts. You have a brilliant illustration of that in our city of Dallas. Did Lee Harvey Oswald, unaided and without conspiracy, assassinate John Fitzgerald Kennedy? Did he? You can ask the American public anywhere and fifty percent of them will say yes and fifty percent of them will say no. You can ask the American people as the Gallup poll did, “Do you believe the Warren Commission that studied and reported on that assassination? Do you believe that commission report?” And the Gallup poll replied, fifty percent of the American people say yes and fifty percent of them say no. This is an event that happened before our very eyes and not in history has there ever been anything so meticulously elaborated, and studied, and investigated as that. Even years after it was done, in this last Congress they appropriated millions of dollars to continue the study. And yet after all of their efforts, fifty percent of our people will say yes and fifty percent of our people will say no. Somehow there has to be an affirmation from God in our hearts for any historical event to become true in our thinking and in our lives. That of course obtains when one stands up to speak concerning the resurrection of our Lord [Matthew 28:1-7]. All I can do is to present the incontrovertible, unassailable, undeniable, unanswerable facts, then you can decide for yourself. You’ll have to. I have seven of them. There are seven unassailable facts concerning the resurrection of Jesus Christ, and we present them now. Number one: a philosophical fact; there has never lived a life more tender, or beautiful, or humble, or self-effacing as the life of Jesus our Lord. Those who listened to Him said, “Never a man spake like that Man” [John 7:46]. You can read those words for yourselves. No man in time or tide ever said the wonderful things that Jesus said. Those who watched Him in His ministry said, “It was never so seen in Israel” [Matthew 9:33]. Never did man do what that Man did; a marvelous servant of mankind [Philippians 2:7]. Preached the gospel to the poor, healed the sick, cleansed the leper, opened the eyes of the blind, gave Himself in a ministering posture all the days assigned for His life [Matthew 11:5]. And how did His life end? It ended in a cruel and shameful tragedy [Matthew 27:32-50]. It posits for us an insoluble mystery, namely, the triumph of evil over good, the victory of wrong over right. Is that all? Does the story end there? Forever is that the story and the history of human life and mankind: justice and truth are nothing, but evil and wrong and violence and terror reign forever! Is that it? That’s a fact to be faced. And we decide for ourselves. Surely, surely there is something more to life than the violence and the death that we see in all the story of mankind. A philosophical fact. Is there something better? Is there something else? Is there another chapter? Is there another word to be said? Fact number two: an empirical, practical, rational fact; how do you explain the empty tomb? [John 20:1-9]. On Friday, His body was embalmed and laid in that sepulcher [John 19:38-42]. Sunday it was gone, and the grave clothes were carefully laid unmolested [John 20:4-9]. How do you account for that? Within days, within days after that Sunday, Simon Peter was preaching to the whole world, “He is raised from the dead!” [Acts 2:23-24]. All it would have taken to interdict and to deny such a preaching is for the Roman government, or for the Jewish people, the Sanhedrin, or the temple officers to expose the body of Christ. That’s all. “Here He is, dead and decaying.” That would have shut up Peter forever, and it would have silenced every gospel minister of the Christ forever and ever. Why didn’t they do that? Because His body was gone [Matthew 28:5-6; Mark 16:5-6; Luke 24:3-6]. Now if His body was gone, there are two alternatives: number one, human hands took it away; or the other alternative, supernatural hands took it away. Let’s look at it again. If it was taken away by human hands, then it was taken by His friends, or it was taken by His foes? If it was taken away by His friends, how could they do it? Over the great stone there was a Roman seal, and guarding that Roman seal was a contingency of soldiers [Matthew 27:63-66]. How could they have done it and leave the grave clothes so beautifully in array? [John 20:3-7]. If it was taken away by their foes, why would they have done it? They are doing, if they’d stole it away, the very thing that they were trying to prevent [Matthew 27:63-66]. You have a pragmatic empirical fact: the fact of the disappearance of the body of our Lord [Matthew 28:5-6]. Fact number three: a psychological fact; the marvelous conversion of the apostles—on Friday they were in despair, Jesus their Lord is dead [Matthew 27:46-50]. They watched Him die. The centurion officially made his report to Pontius Pilate, the Roman procurator, saying, “He is dead.” And when Pilate marveled that He had died so soon [Mark 15:44-45], one of the Roman soldiers, to make doubly sure, took his spear and thrust it into His heart, and the blood and the crimson of his life poured out [John 19:34]. The Sadducees looked upon Him and said, “He is dead.” The Pharisees congratulated themselves and said, “He is dead.” The passers-by looked at Him and said, “He is dead.” They who sat and watched Him said, “He is dead.” The women came to the tomb to embalm a dead body [Mark 16:1-2]. When He arose and appeared to the disciples, they couldn’t believe. They thought they saw an apparition [Luke 24:36-37]. And Thomas, one of the Twelve, said, “Except I put my finger in the print of the nails in His hands, and thrust my hand into His side, I will not believe” [John 20:25]. It was the disciples who doubted. Then like liquid fire, the gospel message of the risen Lord is preached by those same unbelieving disciples! [Acts 4:23-31, 10:44-45]. Forty days the Lord appeared with them [Acts 1:3]. Five hundred at one time saw Him [1 Corinthians 15:6; Matthew 28:16-20]. And the gospel they preached was blazing with truth and convicting power [Acts 2:14-41]. How do you account for that transformation, psychologically, in the apostles? Well, let’s say that those apostles gathered together, and they exclaimed one to the other, “This is horrible. Let us pretend that He is alive. Let us say that He is raised from the dead.” And they go out of that meeting of conspiracy and deception to lay down their lives for a lie, to seal their testimony with their blood; some of them in boiling cauldrons of oil, some of them burned at the stake, some of them fed to the lions—for a lie! It is psychologically impossible. The third fact, a psychological fact: the transformation and the conversion of the apostles. Fact number four: an ecclesiastical fact; the presence of the church. Where did it come from? You’re in one now. All over this globe you’ll find them. Where did the church come from? First, it came from the Jewish people themselves. There were thousands and thousands and thousands of those Jewish people who were converted and baptized and became Christians. All of them at first were Jewish people, thousands of them. The record is very faithful to say, “On this day there were three thousand baptized” [Acts 2:41], and in two chapters later, “There were five thousand andrōn, men, beside women and children” [Acts 4:4]. And then in the next chapter, “And a great company of the priests were obedient to the faith” [Acts 6:7]. It has been estimated that there must have been between fifty thousand and one hundred thousand of those Jewish people who were converted and became members of the church. How did that happen? They go back to the hour when a man was crucified on a cross, and in Deuteronomy 21:23 it says, “Cursed is every man that is hanged on a tree.” How did those Jewish people come to be saved, to become Christians, to be baptized? [Acts 2:38-41]. How did that happen? Then beyond Jerusalem and Judea, that band of Christian believers confronted the entire Greco-Roman world! [Acts 17:6]. They challenged the entire state system of worship, every god and goddess! And when Caesar made it a state traitorous crime not to bow before his image, they died rather than bow. This band of common people, challenging the power and might of the Roman government, how do you account for that? And how do you account for it today? The church: where did it come from? In China, where they lay down their lives now, in Russia, where they die of exposure in Siberia, in a thousand places where the people are hounded and hated and persecuted, how do you account for that? An ecclesiastical fact: somewhere the church had its birth, and that birth is in the living Lord, the resurrection of Jesus Christ [1 Corinthians 15:12-19]. Five is a soteriological fact: the marvelous, wondrous conversion of Saul of Tarsus [Acts 9:1-22]. What a mighty man and what a mighty mind is Saul of Tarsus who became Paul the apostle [Acts 13:9]. In this Bible, you have thirteen letters written by him. Beside those thirteen, you have the epistle of the Hebrews which is Pauline. And beside that you have two other books in this New Testament that were in the framework of the ministry of the apostle Paul. The beloved physician Luke wrote the Gospel of Luke and the Book of Acts. That’s 13, 14, 15, 16—out of 27 books in the Bible, 16 of them were written, in the New Testament, by the apostle Paul. Read them for yourself; it is beyond imagination that a man could write such literature as that. Where did that come from? Where did Paul come from? The third day He was raised according to the Scriptures, and He appeared to Cephas, and He appeared to the apostles, and He appeared to over five hundred at once. . .and last of all, as of one born out of due time. I am the least of the apostles, not meet that I should be called an apostle…but by the grace of God I labored more abundantly than they all. How do you account for that, the marvelous conversion and transformation of Saul of Tarsus? [Acts 9:1-22]. He said, “I saw the living Christ” [1 Corinthians 15:8]. Fact number six is a literary fact: when I pick up the Bible and I read these four Gospels, there’s no literature in any language like them. You can translate it out of the Greek in which it was written into any language in the world, and they are beautiful. They carry their own inherent internal evidence of their truthfulness. It’s a miracle, the literary genius that created these four Gospels. Look just for a moment. To make a God in contact with a man, and their converse be normal is the despair—parenthesis, the failure—of the greatest geniuses of literature. How do you do it? To make it seem normal and truthful that God, a God, walks and lives among men? [John 1:14]. Homer tried it; read it for yourself. The gods of Homer are manifestly fictitious; read it. Or read Shakespeare’s Hamlet; the greatest genius of all time, Shakespeare, the myriad-minded Shakespeare. The ghost of Hamlet is the product of a laborious imagination. I repeat: the greatest geniuses of literature cannot do that. It is manifestly fictitious; it’s a story. But when you read Matthew 28, and Luke 24, and Mark 16, and John 20-21, the beautiful simple story carries its own inherent truthfulness; just the precious walking of the risen Lord God among His people; a literary fact. Last, number seven: an experiential fact; He is alive. He lives [Matthew 28:5-7; Luke 24:4-7]. Alexander the Great is dead. Julius Caesar and Augustus are dead. Charlemagne is dead. William the Conqueror is dead. Washington is dead. Churchill is dead. I couldn’t imagine kneeling down and praying to a Churchill, or a Washington, or a Charlemagne, or a William the Conqueror, or a Caesar, or an Alexander. But I can easily think of somebody me, and somebody you, bowing down in the presence of our living Lord. As he described his life and conversion, I thought of John Wesley. 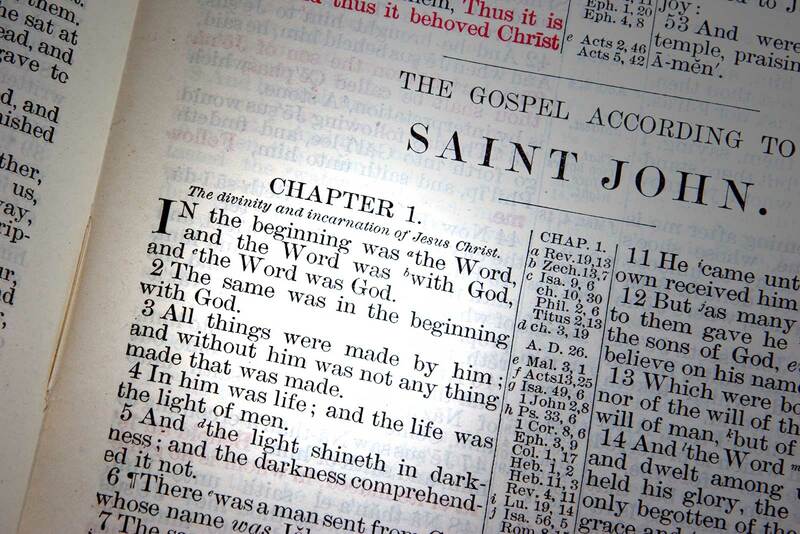 While the preface to Luther’s introduction to the Book of Romans was being read, John Wesley, the Oxford don, wrote in his journal, “I felt my heart strangely warmed.” And the whole world was aflame with the testimony of Wesley, and Whitefield, and those who preached the gospel of the living Lord. That is a fact, and it is one that is confirmed in our experience. I have felt it. And in praying, Somebody bows down His ear to hear, and in time of trouble, He is a great living and sympathetic High Priest [Hebrews 4:14-16]; Jesus, raised from the dead [Matthew 28:5-7; Luke 24:4-7]. May we stand together? Our Lord, however halting or stammering our witness may be, may the Holy Spirit bear witness and record to the truth of the gospel message. If we refuse to believe, all of the arguments and proofs in the world could not dissuade us. But if our hearts are open to the gospel message, somehow its intrinsic, internal, inherent truth lives in our souls. And in this moment that our people stand silent before God, somebody you, to give your heart in faith to Christ [Romans 10:9-10], or to put your life with us in this dear church, make the decision now. And when we sing our appeal, down one of those stairways, down one of these aisles, “Pastor, I have decided for God and here I am.” And thank Thee, Lord, for the sweet harvest, in Thy saving name, amen. Come, while we sing, while we sing.